(Ottawa, Ont.) 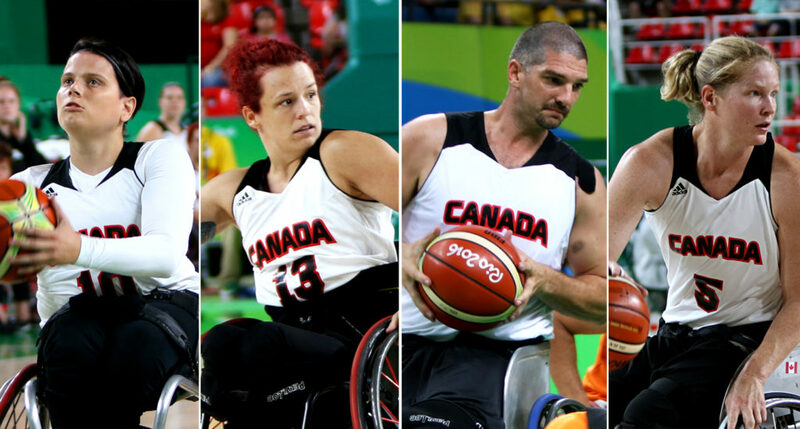 Paralympians and world champions Katie Harnock, Jamey Jewells, Adam Lancia and Janet McLachlan are hanging up their jerseys after announcing their retirements from the Canadian National Wheelchair Basketball Teams. A multiple Paralympic medallist, Lancia dedicated 20 years to playing with the men’s national team program. The veteran trio of women were all key contributors to the decorated history of the Canadian women’s program, including propelling Team Canada to the top of the podium on home soil at the women’s world championship in 2014 in Toronto. Lancia competed at four Paralympic Games and three world championships since joining the Senior Men’s National Team in 2001. He is a two-time Paralympic gold medallist from Athens 2004 and London 2012, as well as a silver medallist from Beijing 2008. He captured a world championship crown in 2006 and a bronze medal in 2002. The native of Scarborough, Ont. began his Team Canada career with the junior men’s program, winning gold medals at the junior men’s world championships in 1997 and 2001. “My story with the national team started with the first-ever junior world championship and stretched all the way forward to the most recent Paralympics in Rio,” said Lancia. “Those 20 years spanned some drastic change in the sport and I’m glad to have been a part of it. I could never think of another way that I would have liked to have spent those 20 years. The friends I have made and lost, and the places and experiences shared with those friends who became my family are irreplaceable. A native of Elmira, Ont., Harnock leaves the international game as a three-time Paralympian (2008, 2012 and 2016) and a two-time world champion (2006 and 2014) after making her debut for the Senior Women’s National Team in 2006. A versatile shooter, she was a world championship all-star in 2014 and also owns a world championship bronze medal from 2010. McLachlan, of Vancouver, B.C., established herself as one of the top players in the world as a dominant point producer and rebounder. She made her first appearance for Team Canada in 2008 and went on to compete at three Paralympics in 2008, 2012 and 2016. She captured gold and bronze medals at the world championships in 2014 and 2010, respectively, and was named to the world championship all-star team in 2014. “It has been an honour and a privilege to put on the Canadian jersey for the last eight years and to be a part of such a historic program,” said McLachlan. “It was a tough decision to make but the timing feels right. I will miss my teammates and staff, the fun and adventures we have had over the years and being a part of Team Canada. Jewells first joined Team Canada in 2011, earning roster spots on both the senior and junior women’s teams. That year she represented Canada at the inaugural world championship for junior women and was named to the tournament all-star team. With the senior team she competed in two Paralympic Games at London 2012 and Rio 2016 and reached the top of the podium at the women’s world championship in 2014. “I am most thankful for the opportunities that arose for me by representing the national team,” said Jewells. “My years with Team Canada have shaped me into the person I am today. Who would have ever thought that a kid from Donkin, N.S. would end up travelling the world, going to two Paralympics, winning a world championship, and going to school in U.S. on a scholarship? I am thankful every day I wake up for the life I get to live.